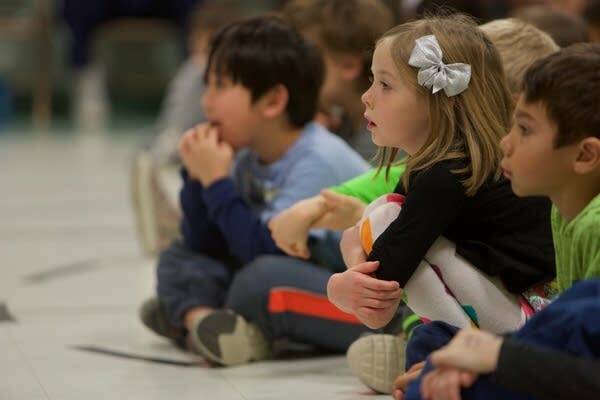 The Rose Ensemble brought music of Christian, Jewish, and Islamic traditions to schools around the Twin Cities. "The Three Faiths" are all intertwined, not the least because they all consider Jerusalem to be their holy city. 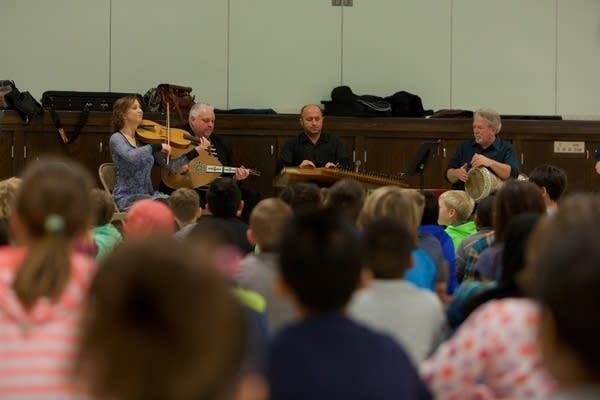 The Arabic classical music and instruments of the Middle East and North Africa migrated to Europe during medieval times and had a significant impact on the music of the Christians and Jews. "Cuando 'l Rey Nimrod" is a song in Ladino, a Hebrew-Spanish hybrid that is the language of the Sephardic Jews of North Africa. The lyrics tell the story of King Nimrod looking out over the field and seeing the prophet Abraham being born under a holy light. "Oy comamos y bebamos" is from the palace songbook for King Ferdinand and Queen Isabella of Spain. It sings of the day before Lent, when the people will eat and drink and celebrate and sing before they begin their fast the next day. "Sallatu Allah" is a song in Arabic that sings of the peace of the divine (Allah) and sharing that peace. 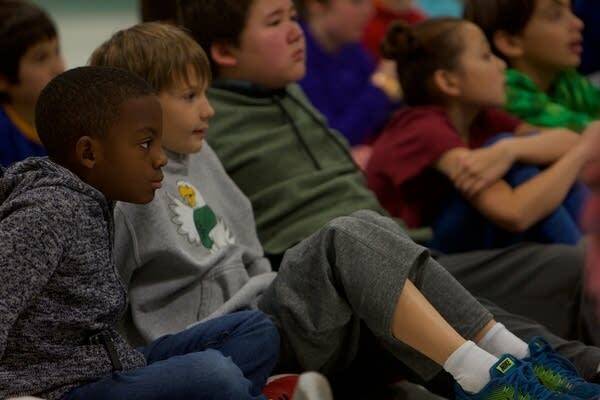 You can also hear members of the ensemble introduce themselves and demo their instruments in the clip titled "Rose Ensemble instrument demos." 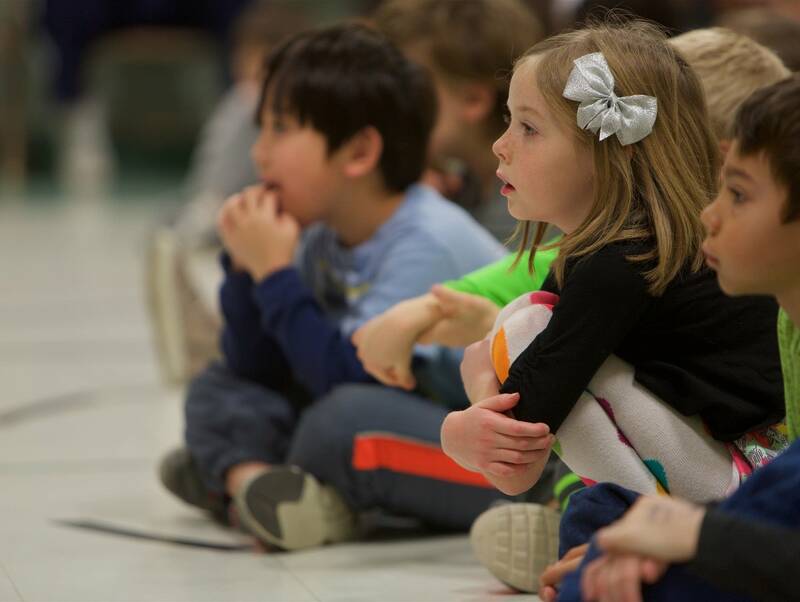 Students at Oak Grove Elementary in Bloomington, Minn., listen to the Rose Ensemble with interest. 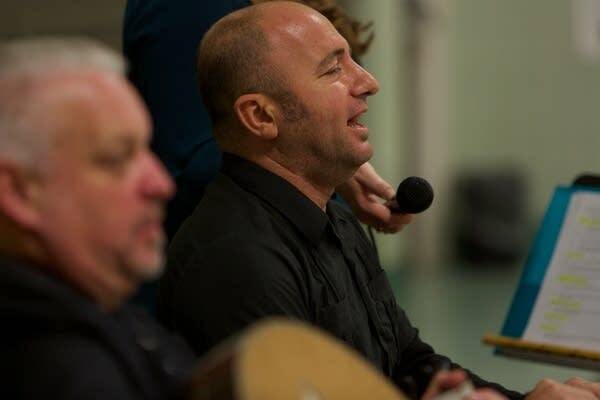 From left: Ginna Watson, vielle; David Burk, oud; Zafer Tawil, qanoun; Tim O'Keefe, darbuka. Unlike western classical music, in Arab classical music, there is no harmony. All the instruments and singers perform a variation of the same melody line. Ginna Watson demonstrates the sound of the "vielle," a medieval precursor to the violin. "Vielle" is Old French for "fiddle," and Watson's is a copy of a version from 15th-century Spain. Like the oud, it has a bent back neck, which is a Middle Eastern feature. It has five strings (unlike a violin, which has four), which are made from sheep or cow gut. It has a flat back like a guitar and Islamic crescent-shaped sound holes (unlike the F-shaped holes of the modern string family). Musically, the vielle is important for creating drone chord to accompany singers. 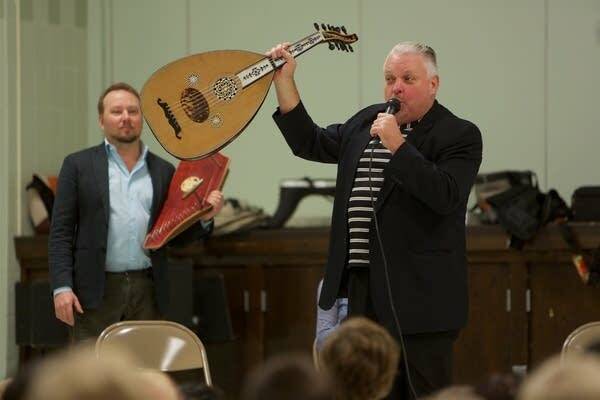 David Burk holds up his oud as he describes it for the audience. 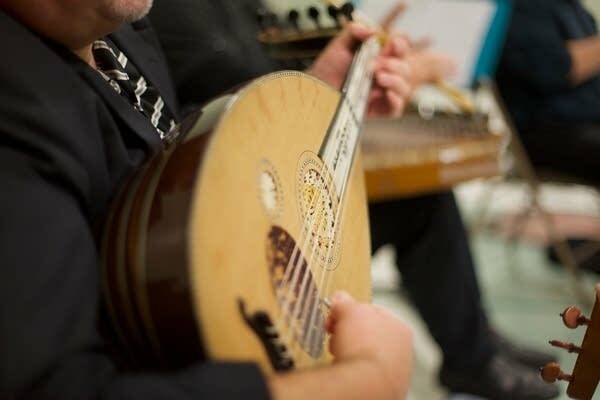 The roots of the oud go back 2,000 years; it is the ancestor to the lute, which is itself an ancestor to the guitar. The oud originated in the Middle East, and the lute came about as a result of the oud being introduced to Europeans. Unlike a guitar, the oud has no frets and 11 strings. It has a pear-shaped body, like a lute. 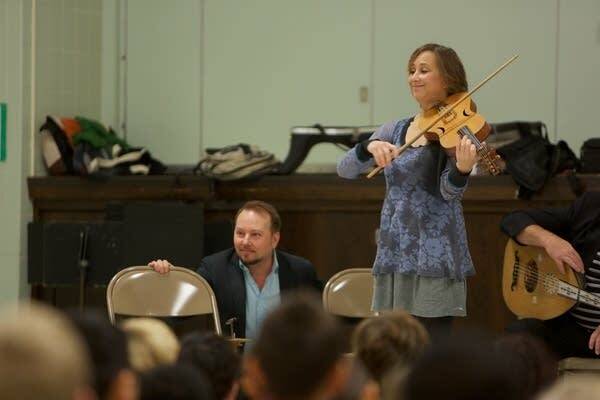 The Rose Ensemble brought many fascinating and unusual (to Western eyes and ears) instruments to the performance. The qanoun (KA-noon) is made of wood and goat skin. 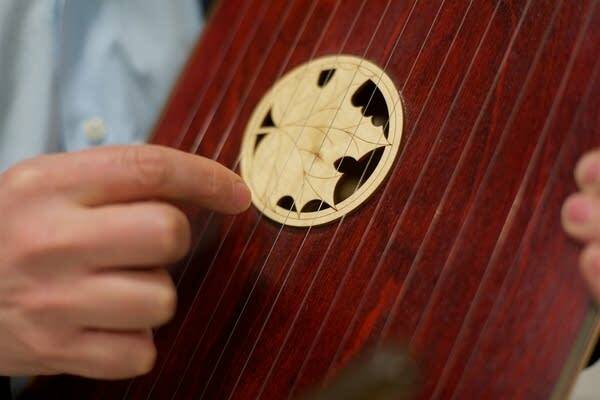 It has 74 strings and is played with picks, one on each pointer finger while the player holds it on his or her lap. 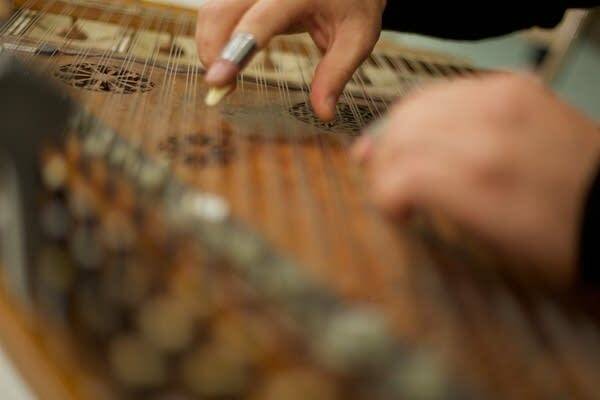 The qanoun is capable of playing microtones, which are like the "gray" pitches between the black and white keys on the piano in Western music. Microtones are a significant trait of Arabic music, and they can be played only on fretless instruments. Instrumentalist and Arabic singer Zafer Tawil is a native of Jerusalem who now resides in Brooklyn, N.Y. 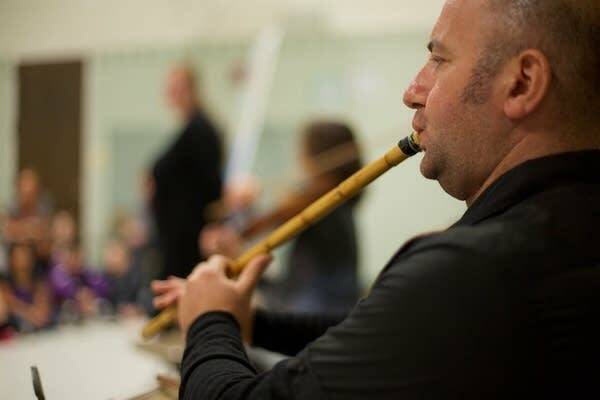 Here he is playing the "nay," an in-blown flute found across North Africa and the Middle East. It is incredibly old, and even depicted in ancient Egyptian hieroglyphics. Jerusalem native Zafer Tawil sings "Sallatu Allah," which is about sharing the peace in the divine. A lot of Arabic music is in call-and-response form and features microtones. The "riqq" (tambourine) and "darbuka" (drum) are important percussion instruments in Middle Eastern, North African and Mediterranean music. There are basically two sounds: a low "doom" and a higher, sharp "teck." There are variations of these instruments all over the world. 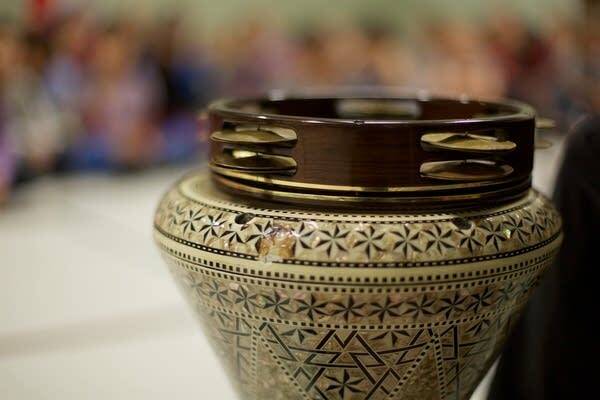 The "darbuka" is made from pottery and has a beautiful pattern on it. The best drum heads for this instrument are made from fish skin, but this particular drum has an artificial head. Not pictured is the "bendr," which is a frame drum, a version of which is also featured in most cultures around the world. 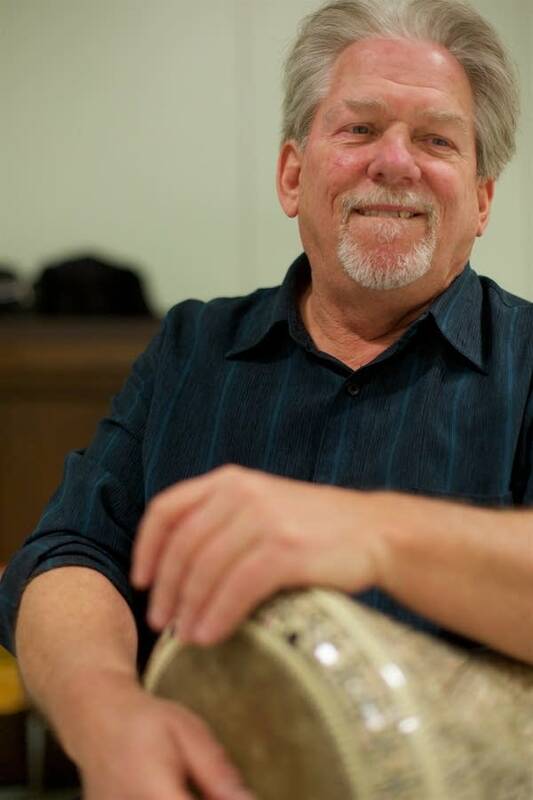 Tim O'Keefe plays the darbuka on his lap, under his arm. The psaltry has a sparkly sound. 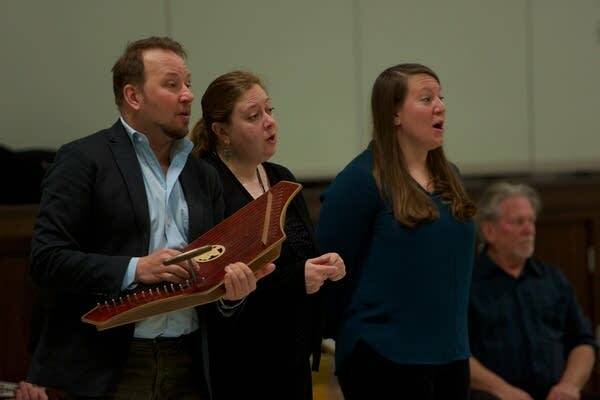 Alyssa Anderson and Clara Osowski duet on "Cives Celestis," accompanied by Jordan Sramek on the psaltry, a kind of lap harp. "Cives Celestis" is a Latin chant from the medieval Christian tradition that sings of the beauty of the jewels of Jerusalem and how lucky those people are who live in the holy city.